MISSION, Texas, July 28, 2016 – The Mission Economic Development Corporation, Workforce Solutions and Code RGV have launched an innovative new program – a coding boot camp – that will provide highly sought after computer training for dozens of students with the help of a collaborative matching state grant. The Texas Workforce Commission’s High Demand Job Training grant will fund a program that will consist of pre-work job readiness and will educate participants in computer coding taught by industry experts in a three-month long coding boot camp offered by the Mission EDC, Workforce Solutions (the local workforce development board) and Code RGV, a local educational non-profit that specializes in tech skills development. The first cohort of students, after the rigorous prep, code and job readiness training, will be certified in Full Stack Web Development – a high-demand career in Texas. The aim is to place students in high-demand high-pay occupations with employers as programmers that develop web, backend, and mobile applications with the latest industry tech and skills. Mission EDC and its partners have received national recognition for its Code the Town initiative, which for the past two years has provided elementary and high school students in the area with basic code training. The program was recognized as a Bright Spot in Hispanic Education by the White House Initiative on Educational Excellence for Hispanics. Code RGV, who has worked for years to enhance the region’s workforce with computer and high-tech skills training, has employed certified industry professionals across the nation to teach these courses and mentor the students. The grant program will fund more high-demand job training courses later this year and next. Moving forward, the program will be offered at Mission EDC’s new home, the Center for Education and Economic Development, or the CEED, at 801 N. Bryan Road. 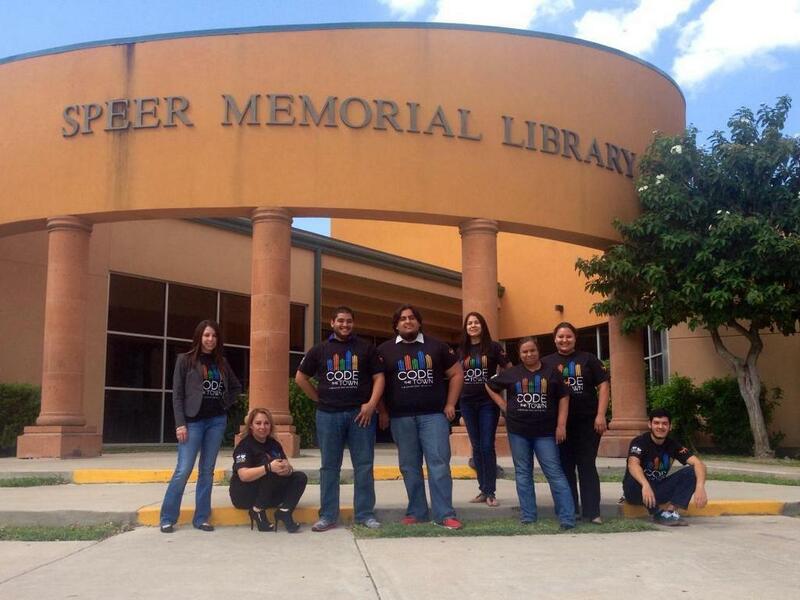 Code RGV will also be based there along with a variety of startups, entrepreneurs and educators. For more information, please contact @MissionEDC CEO Alex Meade at 956.585.0040. Also, try @Code_RGV CEO Olmo Maldonado at 956.230.6743 for the latest updates and Texas Workforce Commission is at @TXWorkforce. MISSION, TEXAS (September 15, 2015) — Earlier this summer, Mission EDC and its partners, Sylvan Learning RGV and Border Kids Code, answered the call for Bright Spots in Hispanic Education, an effort by the White House Initiative on Educational Excellence for Hispanics. Today, this unique public-private partnership (the only Bright Spot to include an EDC) is honored to announce the tremendous recognition. As a Bright Spot, Code the Town, will be part of a national online catalog that includes over 230 programs that invest in key education priorities for Hispanics. 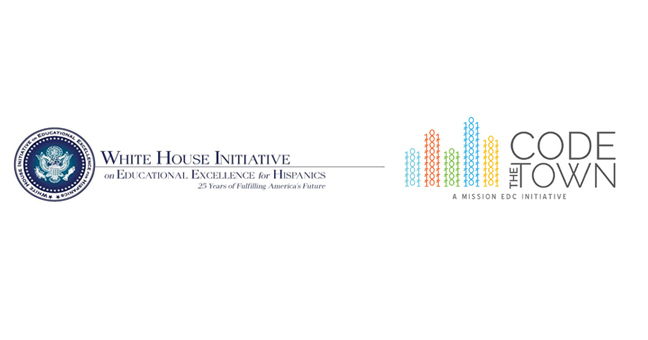 The White House Initiative on Educational Excellence for Hispanics seeks to leverage these Bright Spots to encourage collaboration between stakeholders focused on similar issues in sharing data-driven approaches, promising practices, peer advice, and effective partnerships, ultimately resulting in increased support for the educational attainment of the Hispanic community, from cradle-to-career. The announcement was made by Alejandra Ceja, Executive Director of the Initiative on September 15, 2015 at the launch of Hispanic Heritage Month and in honor of the Initiative’s 25th anniversary in Washington, D.C. “There has been notable progress in Hispanic educational achievement, and it is due to the efforts of these Bright Spots in Hispanic Education, programs and organizations working throughout the country to help Hispanic students reach their full potential,” said Ceja. The White House Initiative on Educational Excellence for Hispanics was established in 1990 to address the educational disparities faced by the Hispanic community. To learn more about the Initiative and to view the Bright Spots in Hispanic Education national online catalog visit www.ed.gov/HispanicInitiative. Coding skills, digital literacy and STEM (Science, Technology, Engineering and Math) education are crucial components for job growth across the United States. Recognizing the need for educational and workforce development opportunities in the Texas Rio Grande Valley region, the Mission Economic Development Corporation, invited strategic local partners, Sylvan Learning and Border Kids Code, to join in creating Code the Town. Code the Town was launched in Fall of 2014 as an initiative that provides students and teachers with knowledge in the specialized technology skills so critical in today’s classrooms and workplaces. Code the Town represents a public/private partnership that is unique to the Mission community, and the project is setting the pace for innovative alliances that can drive educational and economic progress in communities nationwide. MISSION, TEXAS (April 30, 2015) — In an effort to stay on top of the latest technologies and programming languages, Code the Town will now be offering Python classes using Raspberry Pi 2 Model B to students from the Mission community in the summer and fall. Python is a widely used general-purpose, high-level programming language. Its design philosophy emphasizes code readability, and its syntax allows programmers to express concepts in fewer lines of code than would be possible in languages such as C++ or Java. The language provides constructs intended to enable clear programs on both a small and large scale. The Python Software Foundation (PSF), a non-profit membership organization, devoted to advancing open source technology related to the Python programming language, has awarded a $3,000 grant to Code the Town. The mission of the Python Software Foundation is to promote, protect, and advance the Python programming language, and to support and facilitate the growth of a diverse and international community of Python programmers. The grant will be used to purchase several Raspberry Pi 2 Model B computers to teach the Python language to Mission students in K-12 with a goal of teaching at least 60 students by the end of fall. The Raspberry Pi is a credit card-sized computer developed in the UK by the Raspberry Pi Foundation with the intention of promoting the teaching of basic computer science in schools. The Raspberry Pi Foundation is a charitable organization registered with the Charity Commission for England and Wales. The Foundation aims to promote the study of computer science and related topics, especially at school level, and to put the fun back into learning computing. For more information, please visit www.codethetown.com or contact Mission EDC at (956) 585-0040. To learn more about Python, please visit www.python.org. AUSTIN, Texas (April 16, 2015) – Computer Science education and jobs were the topics of discussion at the inaugural Texas Alliance for Computer Science Education (TACSE) meeting held April 8, 2015, at the Microsoft Office in Austin. Over 60 Computer Science and economic development professionals discussed how the Texas school system could improve Computer Science (CS) education in primary and secondary schools. The group shared the concern that without teaching the fundamentals of CS, Texas would not thrive in a 21st-century economy. An entire generation of Texans, they warned, will be joining a post-industrial workforce that is dependent on software and digital technology. Carol Fletcher, Ph. D., TACSE Founder and Co-Chair, proposed a plan for Building the Texas Computer Science Pipeline. Fletcher identified four major issues: 1) lack of trained and certified CS teachers; 2) no incentive for administrative investment in CS pathway; (3) low student/parent demand; and (4) no system connecting high school courses to careers in industry. Code the Town is a public-private partnership that teaches the community how to write computer code, an increasingly selectable skill in a tech-driven jobs market. To date and in a matter of six months since the program began, the program has taught over 400 students in grades K-6, and over 100 teachers from grades K-12. According to Code.org, by 2020, there will be 1 million more computing jobs than students/graduates to fill them, resulting in a $500 billion opportunity gap. Only one in 10 U.S. schools offer programming classes (Code.org, 2014) and Texas is no exception, with less than 15 percent of Texas high schools offering Advanced Placement (AP) Computer Science courses in 2013-14 according to the College Board (2014). The Texas Alliance for Computer Science Education (TACSE) is an open community group consisting of business leaders, parents, educators, school and university administrators, government officials and concerned citizens that are dedicated to bringing computer science education to students in grades K-12. TACSE was founded by Carol Fletcher, Ph. D., Texas Regional Collaboratives-University of Texas at Austin, and Hal Speed, a high-tech industry veteran and Code.org affiliate. Visit www.TACSE.org for more information. MISSION, RGV – President Obama recently promoted what he called an incredible economic development opportunity – coding boot camps where students and workers can quickly learn the computer skills needed in the 21st Century. Obama dubbed his initiative TechHire and called on mayors and council members in cities across America to help, pointing out that that these computers skills are needed far beyond Silicon Valley. He said such coding programs have the potential to rapidly empower under-served minority communities. 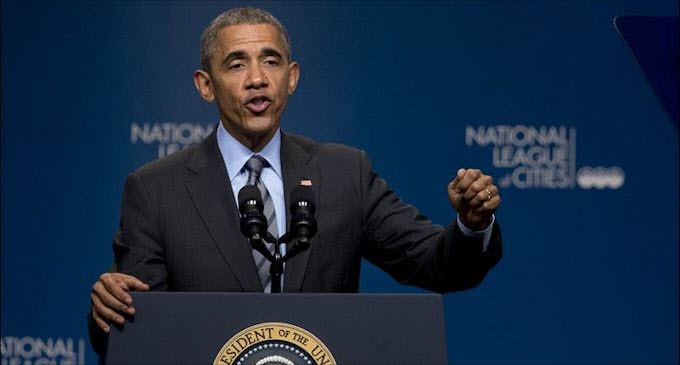 Obama could easily have used Mission, Texas, as the poster child for his initiative, which he unveiled at a National League of Cities congressional conference in Washington, D.C. This is because Mission’s economic development corporation, working with program partners Sylvan Learning and Border Kids Code, started its computer coding initiative nine months before Obama gave his remarks. The program, called Code the Town, has already trained over 400 kids from K – 6 and 100 K – 12 teachers. MISSION, TEXAS (December 9, 2014) — Sylvan Learning, Mission EDC, and Border Kids Code are thrilled about Code The Town’s FIRST graduating class during National Computer Science Education Week. The support for promoting STEM in the City of Mission has been overwhelming. It has been so exciting to see the enthusiastic response from educators, students, and parents within the Mission community as they have expanded their computer science and coding knowledge. Approximately 150 students ranging from grades K – 6 will be receiving certificates of completion and additional awards for projects done outside the Sylvan Learning Boot Camp. Sylvan offered two-week boot camps consisting of daily eight-hour sessions. Sylvan Learning (corporate) had already partnered with Tynker Technology to create a coding program that allows students to write their own video games and apps using STEM (Science-Technology-Engineering-Math), reading, logic, and critical thinking skills. Mission elementary students were the first to pilot this new curriculum. In addition, the children also had the opportunity to collaborate with other children on building a project that they will present during the graduation event. Forty middle and high school career and technology teachers from Mission, Sharyland, and La Joya School Districts also attended a full-day professional development session with Dalinda Alcantar and Marcos Silva, founders of Border Kids Code. Teachers learned how to execute coding programs. With this Trainer of Trainers model, these teachers returned to their schools to teach coding to their students. The overall impact these teachers and administrators had was in excess of 7,000 students. In addition, an Hour of Code event will take place during graduation. Plenty of workstations will be setup throughout the City of Mission’s Boys and Girls Club to allow attendees to participate in the Hour of Code. The Hour of Code is a one-hour introduction to computer science, designed to demystify code and show that anybody can learn the basics. Anybody can host an Hour of Code anytime, but the grassroots campaign goal is for tens of millions of students to try an Hour of Code during December 8-14, 2014, in celebration of Computer Science Education Week. 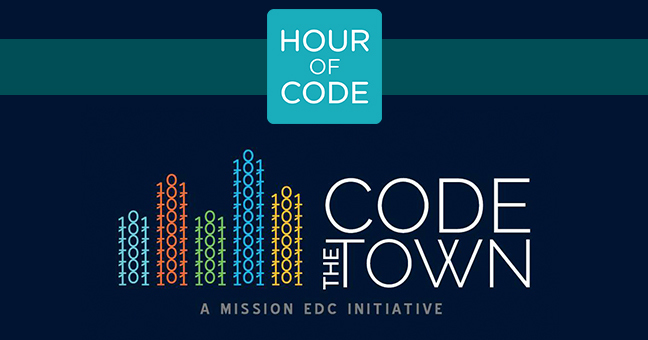 For more information on Code the Town, please visit www.codethetown.com or contact Mission EDC at (956) 585-0040. 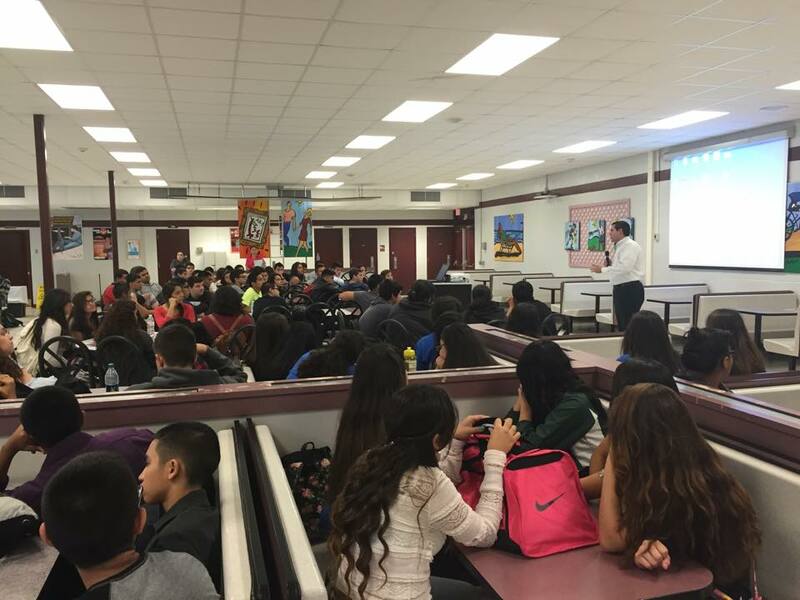 Edinburg, TX (December 9, 2014) — An All-Star cast of school and community leaders from across the Rio Grande Valley (RGV) will be participating in The Hour of Code, a global movement to increase computer science on Thursday December 11, 2014 from 4:15- 5:15 at Robert Vela High School (RVHS) in Edinburg. Coordinated by the school’s AVID program and heavily supported by principal, Mrs. Eva Torres, The Hour of Code at RVHS is the largest event in the RGV. Leading by example, Dr. Rene Gutierrez, Superintendent of Schools, will take the challenge and participate in the Hour following the lead of President Barack Obama who recently finished his hour as well in Washington D.C. Other Valley leaders who will be in attendance include: Eddie Cantu, Hidalgo County Commissioner Elect, Veronica Gonzalez, UTRGV Vice President for Government and Community Relations, Ramiro Garza, Jr., Edinburg City Manager, Sonny Palacios, Edinburg School Board Member, John Sargent, Business Professor at UTPA, Omar Quintanilla, Vice President of Frost Bank, Nick Maddox, Pastor at BT McAllen, Susan Valverde of Sylvan RGV, Olmo Maldonado, founder of Tech Tuesdays, Marcos Silva, co-founder of Border Kids Code, Chris Ardis, Education columnist and a host of organizations including Edinburg EDC and Mission EDC. More importantly, RVHS students and teachers will be in attendance representing their respective club or athletic event. They will all take part in the one-hour video and game based curriculum provided by code.org. “The Hour of Code is about bringing awareness to the importance of computer science and to demystify the stereotype that you have to be excellent at Math and Science to learn to code. In fact, anyone can learn to code! More importantly, The Hour of Code is about creating opportunity for our students and creating economic opportunity for our local community,” says Dalinda Gonzalez-Alcantar, RVHS AVID coordinator. MISSION, TEXAS (December 3, 2014) — Members of the Code the Town team presented at this month’s Region One Superintendent meeting to promote the Hour of Code initiative and generate awareness for the value of computer science education. Susan Valverde (Sylvan Learning of RGV), Dalinda Alcantar (Border Kids Code), and Alex Meade (Mission EDC), were invited to the Nov. 20 meeting by Dr. Cornelio Gonzalez, Executive Director of Region One. new language. The Code the Town program is broken down into primary (K-6), secondary (7-12) and adults tracks. We will help you navigate through a skill set that will not only open up new possibilities for individuals in the tech world, but we will help build critical thinking and problem solving skills in our youth. We had a lot of kids who were very interested in the ‪#‎codethetown‬ initiative. At least 15 kids came up to us after the presentation at the Mission Collegiate High School, and I’m sure there are more who were just to shy to ask questions. Looking forward to working with them through this great program.